Posted on Tuesday, November 20th, 2018 by Lizzie Sarah Biddle. 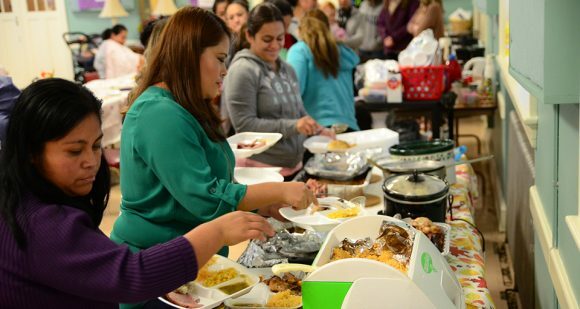 Thriving at Three families and program staff enjoy a holiday feast! The weekly get together of moms and kids is a special part of CNNC’s Thriving at Three program, serving Latina moms and their kids ages 0-4. 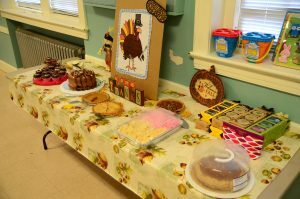 On Thursday, Nov. 15th, the moms came together for their annual Thanksgiving celebration. The weather outside painted a grim winter scene, full of cold rain and wind, but the fellowship hall at Church of the Covenant Presbyterian reminded everyone of fall with warm decor including leaves, pumpkins, and turkeys scattered around; even pieces of art done by the children were displayed. The day started off with classes but soon everyone reunited for the much anticipated gathering. 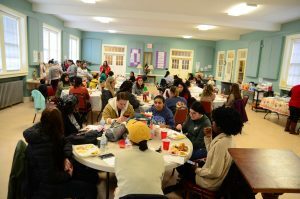 It wouldn’t be thanksgiving without food- interns, volunteers, coordinators (and their families) prepared and provided home cooked dishes from turkey, ham and sides to various desserts! 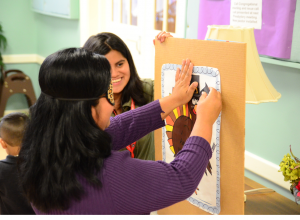 But the fun didn’t end there, Musical chairs, pin the hat on the turkey, and themed bingo were played among the volunteers, mothers, and children for the chance to win prizes. It was a day full of togetherness and an excellent way to kick off the holiday season.